Today’s modern laundry room has come a long way. Dryer Vent Cleaning helps keep your appliance from overheating, running too long, damaging clothing. What Causes a Clogged Dryer Vent? Clogged dryer vent causes buildup of lint and other debris. Our Customers with today’s laundry rooms find clothes dryers almost anywhere in the home creating very long vents. Your Duct Work has complicated runs that have several bends. This scenario means dryer vents tend to create back pressure and the dryer’s efficiency is degraded. Homeowners with Long clothes dryer vents will collect lint more rapidly than dryer ducts with shorter runs and less turns. Other hazards are dryer vents made of flexible plastic occur When the dryer gets pushed back against the wall it gets crushed . This type of dryer duct materials are more likely to sag. This is why we recommend ridge metal, or UL approved flexible metal ducts. 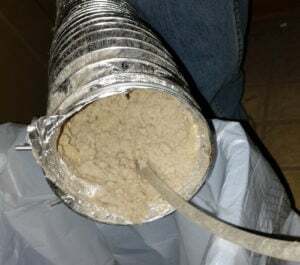 All connections should be with aluminum foil tape for dryer vent. Dryer vents should not have screws, or duct tape. Screws catch lint and the tape will dry out and be useless. Customers that use Screens, or cages at the Dryer duct termination point outside your home will prevent animals from getting in, consequently you’ll need to check frequently for lint buildup. Home owners that clean the clothes dyer vent screen will get proper air flow. Good air flow is approximately 15 MPH up to 20 MPH at the exit outside your home. Want to learn more? Please call The Lint Kink at 847-874-4805 or visit us online at TheLintKing.com.